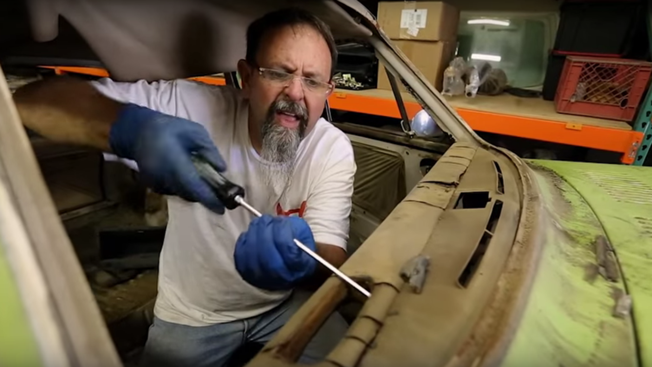 Car mechanic/restorer and Honda specialist Tim Mings has a special place in his heart (and possibly his beard) for the N600, which was Honda's introduction to the U.S. car market back in the 1960s. Turns out that one of the random N600s he bought and kept in storage for years is the vaunted Serial One, better known as the very first Honda N600. Thanks to that serendipitous good fortune, Mings now gets to restore the historic vehicle, and Honda agency RPA is turning his work into an online documentary that honors the brand's American history. The work will be available on the company's various social media outlets, and will follow the restoration of the classic vehicle. Hopefully we'll get to see Mings pet his cute cat some more, too. While seeing weekly installments about the progress of Mings' restoration will interest plenty of gearheads, we're more curious how the first-ever N600 found its way into the shop of the one guy who was born to repair it. The amount of separate coincidences involved to make that possible is staggering … like the car version of Homeward Bound.